Pioneers in the industry, we offer combination board (half white & half green), exhibit panel for outdoor use, multiple exhibit panel for outdoor use, exhibit panel with acrylic cover, flexible stand for white / green chalk board and exhibit panel for indoor use from India. 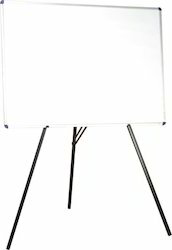 Half White board & Half Green Chalk board with MDF sheet base secured in fine aluminium channel with rounded plastic corners and fine hanging arrangement. Both side display. Soft pinning solotex board covered with blazer cloth on fron secured in fine aluminium channel with rounded plastic corners. Mounted on a stout M.S.stand with powder coated paint finish. Height adjustable with the help of ABS clamps. 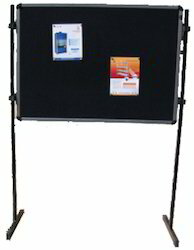 Exhibits Panel for Outdoor Use Size 120 x 90cm. 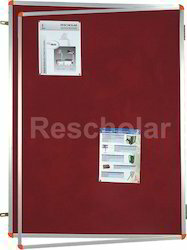 Exhibits Panel for Outdoor Use Size 150 x 90cm. 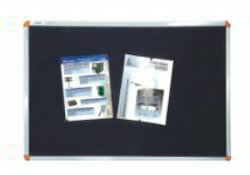 Exhibits Panel for Outdoor Use Size 180 x 90cm. Both side display. 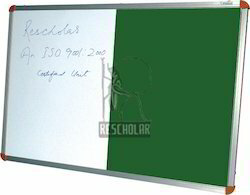 Soft pinning solotex board covered with blazer cloth on Front secured in fine aluminium channel with rounded plastic corners. Mounted on a stout M.S.Stand with powder coated paint finish. height adjustable with the help of ABS clamps. Single side display. Soft pining solotex board wrapped in dark green colour blazer cloth on front. secured in fine aluminium channel with rounded plastic corners & nice hanging arrangment. Back of board covered with melamine sheet for moistance resistance.Hinged acrylic door in aluminium frame with locking arrangement. Single side display. Soft pinning solotex board covered with blazer cloth on front secured in fine aluminium channel with rounded plastic corners & nice hanging arrangement. Back of board covered with melamine sheet for moisture resistance. Three Legged mild steel stand with powder coated paint finish. 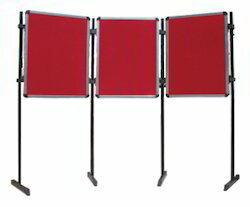 Looking for Exhibit and Extension Equipment ?